Cafe by day, izakaya by night, Cafe Ish has a unique menu featuring dishes that blend Japanese flavours with Australian native ingredients. You won’t find teriyaki chicken bento boxes here, and the sign above the door proclaims “No sushi!” – it’s creative, tasty food at the corner cafe I wish was in my neighbourhood. 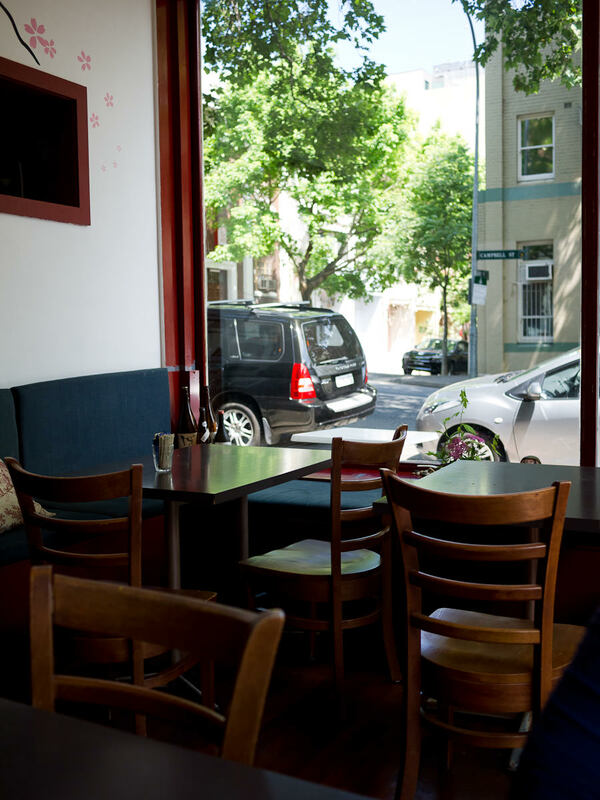 When I visited Sydney in 2010 I had breakfast at Cafe Ish with Sydney food blogger Billy Law, before he went on Masterchef Australia. 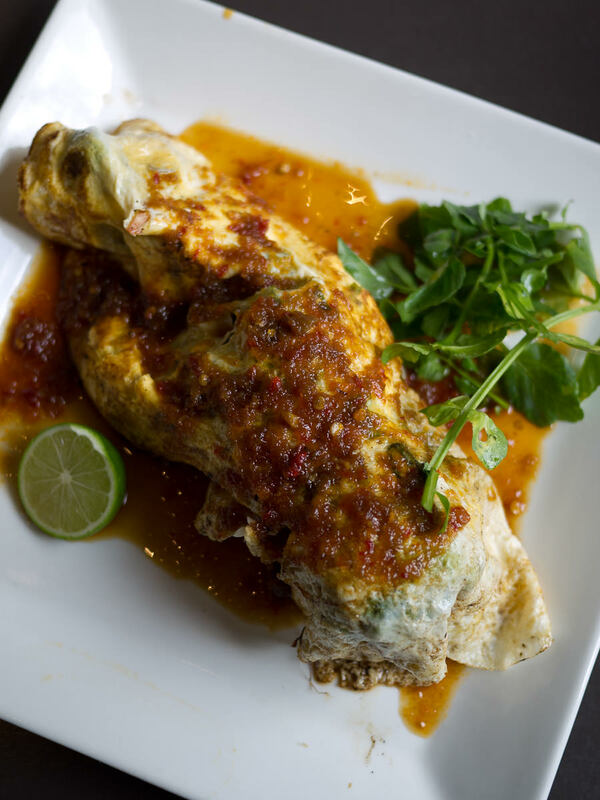 We were eager to try Cafe Ish’s famous kara age soft shell crab omelette, but were disappointed to be told it wasn’t available at breakfast time. We did enjoy the wonderful Croc in the Rock and baked beans made with ham hock, but soon after, I discovered my fondness for soft shell crab and like any proud glutton, don’t mind admitting I couldn’t stop thinking about what I’d missed out on. Chef and owner Joshua Nicholls read my blog post afterwards, and as it turns out, the chef on duty (who wasn’t Josh) should’ve turned the deep fryer on and should’ve been able to cook us the omelette. 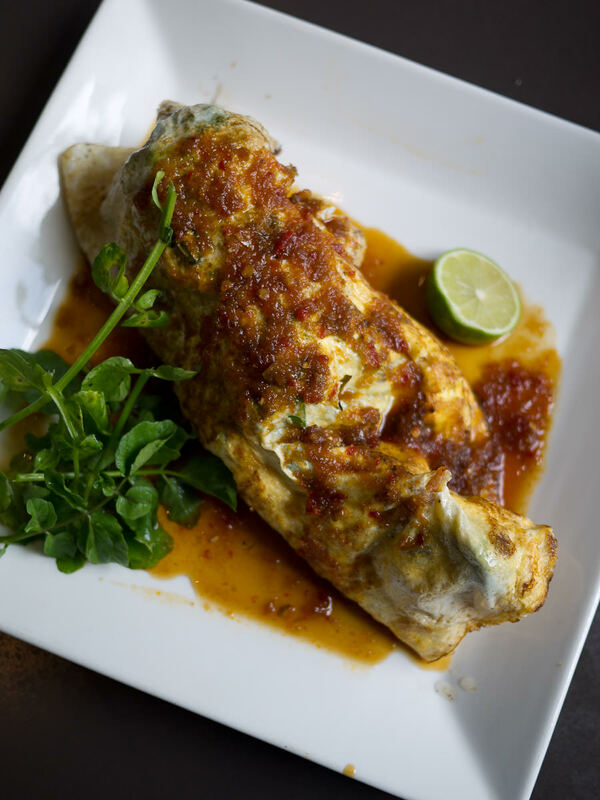 Josh promised to shout me a kara age soft shell crab omelette on my next visit. It’s taken me more than 18 months to return to Cafe Ish, but Josh has not forgotten! 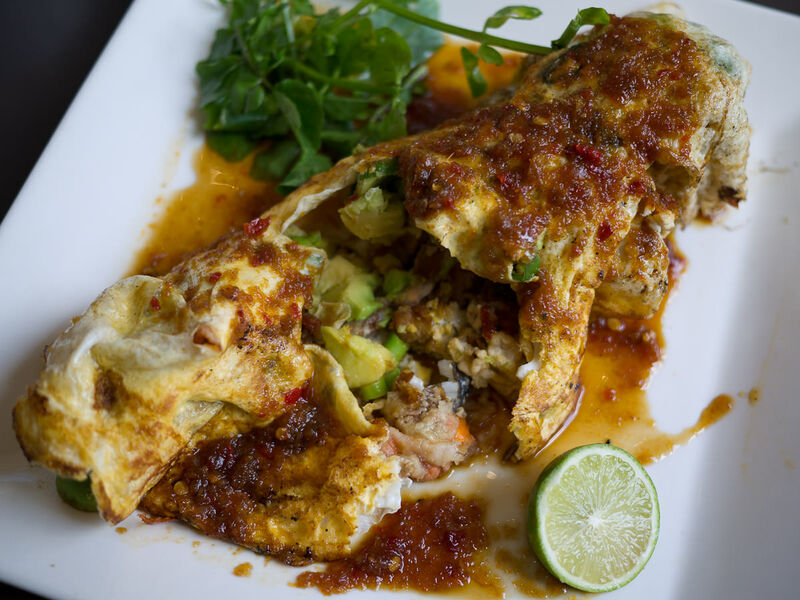 It’s kara age soft shell crab with chunks of avocado and chopped shallots all wrapped in a crinkly omelette with a dressing of garlic, chilli, soy and ginger, served with fresh lime. It’s also available in a smaller size in a lunch set with rice and miso soup (AU$16.50), but I want the pure kara age crab omelette experience, so I’ve ordered the full sized beauty. It looks and smells absolutely glorious, even better than I had imagined. It’s a delicious hefty bundle. The crab is crispy yet chewy, the avocado soft and creamy. The dressing is sweet yet savoury, and strongly spiced. Is there a restaurant dish that eluded you for a long time (for whatever reason) that you eventually got to taste? Did it meet your expectations? 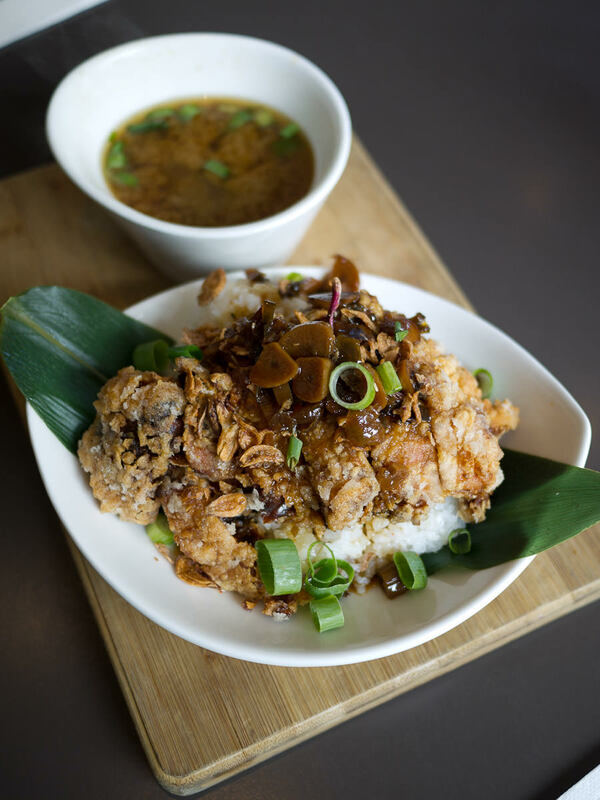 Jay orders Ai’s Freaking Awesome Fried Chicken (AU$14.50), served as a lunch set with rice and miso soup. 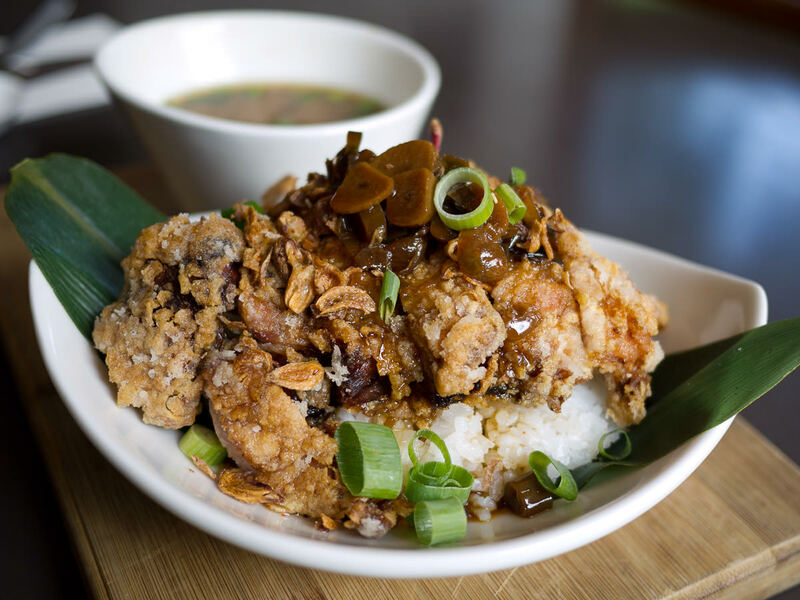 The chicken is freshly deep-fried, popping hot and succulent, sprinkled with an unbelievably moreish mix of crispy fried shallots, chopped fresh spring onion and vinegary pickled garlic. The fried chicken is indeed “freaking awesome”. Josh tells us the recipe that inspired this dish was discovered in an old Japanese cookbook by his wife and business partner Ai. The soft pickled garlic is the stuff of my dreams and I ask Josh how it’s prepared. That remains a closely guarded Ish secret – which is fair enough, I reckon. 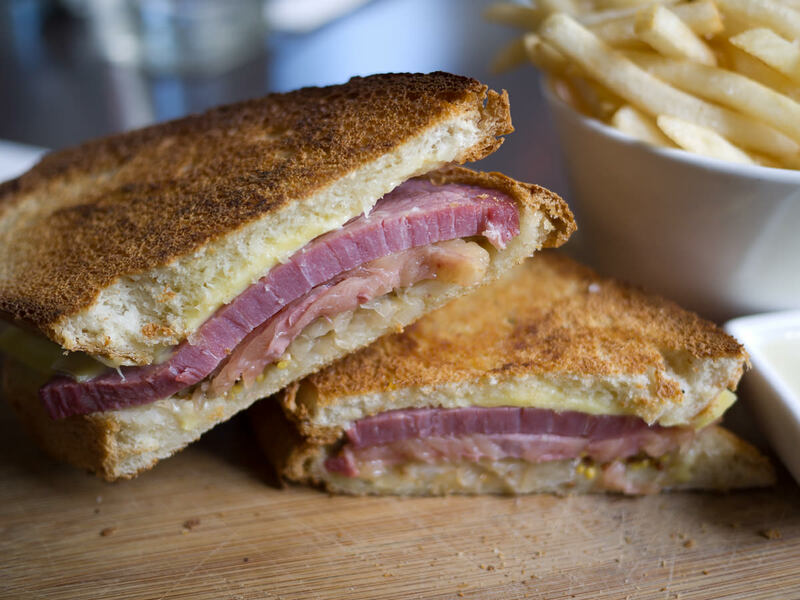 Juji orders the Reuben Ish (AU$9.50) Cafe Ish’s version of the Reuben sandwich, with a thick juicy slice of aniseed myrtle corned free range Wagyu beef, braised cabbage, wholegrain mustard, bush tomato aioli and cheese, all between toasted house-made bread. 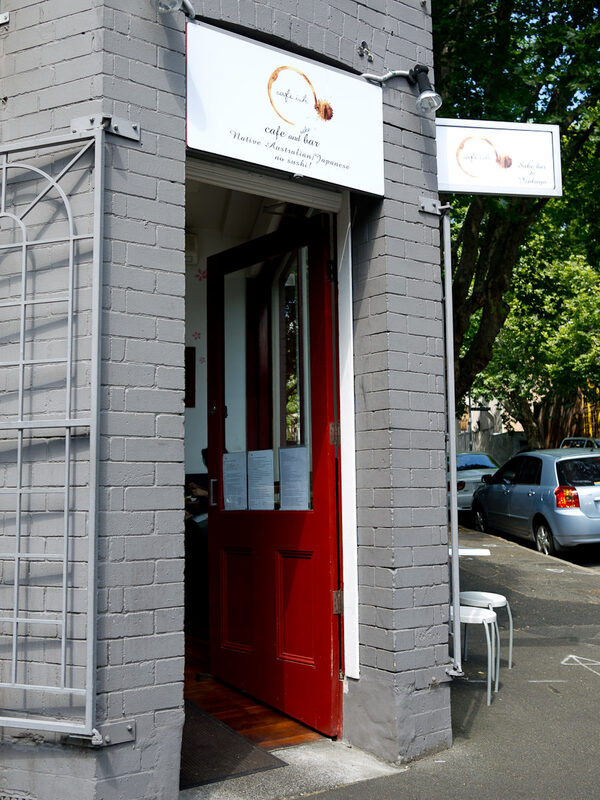 There are other sandwiches available, including 8-hour roasted saltbush lamb, fried chicken, roasted pumpkin and a BLT. Whichever sandwich, you choose the bread: house-made white, wattle grain, Turkish, or a wrap. 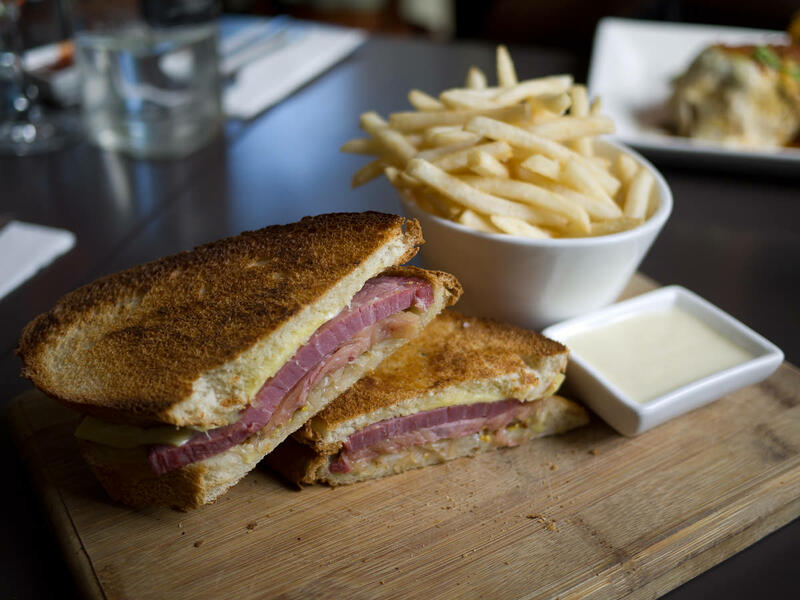 With a side of shoestring fries and creamy wasabi mayo, it’s a great lunch. Josh joins us for a chat as we order Cafe Ish’s signature Wattle Maccacino (coffee made with wattle and macadamia) for Juji and Jay, and a hot chocolate for me. Like on my previous visit, my hot chocolate is served in a Max Brenner-style hug mug, a pleasure to cradle in my hands in between sips. 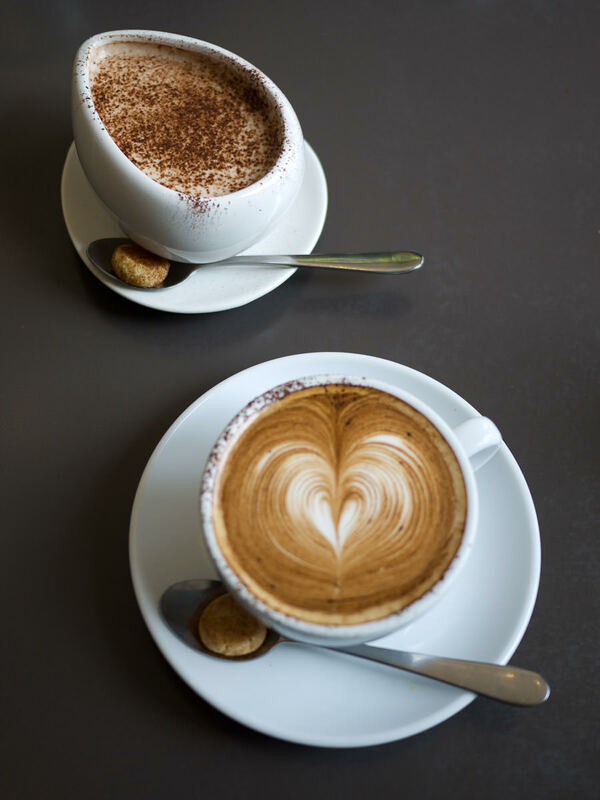 Our hot drinks come with tiny snickerdoodle cookies, also made at Cafe Ish. Josh suggests a few places we might like to check out for more good eats. We did follow some of his recommendations – the posts are on the way. Thanks, Josh and Ai for a fantastic lunch and for treating me to your magnificent kara age crab omelette. It’s easily one of my favourite and most memorable dishes of 2011. Hope to see you for Dinner ish next time I’m in Sydney! I had an explosive but fun experience with a bottle of Ramune, Japanese lemonade – I had my hands full and sticky so didn’t photograph what happened, but you can read about it at Juji’s post on Cafe Ish. There are more Sydney posts on the way. I’m still also finishing off my series from my September trip to Kuching. And of course, there will be posts on eating in Perth too. Congratulations to the winners of my Gourmet Farmer DVD competition. If your name’s listed, make sure you check your email!